The Allure of the Seas currently sails 7 night cruises to the Western and Eastern Caribbean from Fort Lauderdale, year round. January 29, 2012, a small fire was reported in the ship’s incineration area. April 20, 2012, the captain publicly informed all passengers that there is a fire in the engine room. The ship’s section 6 was evacuated. No injuries were reported. For about 2 hours the ship drifted then continued powered by only one engine. The engine fire was quickly extinguished by the high fog system which was activated immediately. When the incident happened, the ship was en-route to Port Everglades (Fort Lauderdale) from St Maarten, and arrived in homeport as scheduled (on April 22). 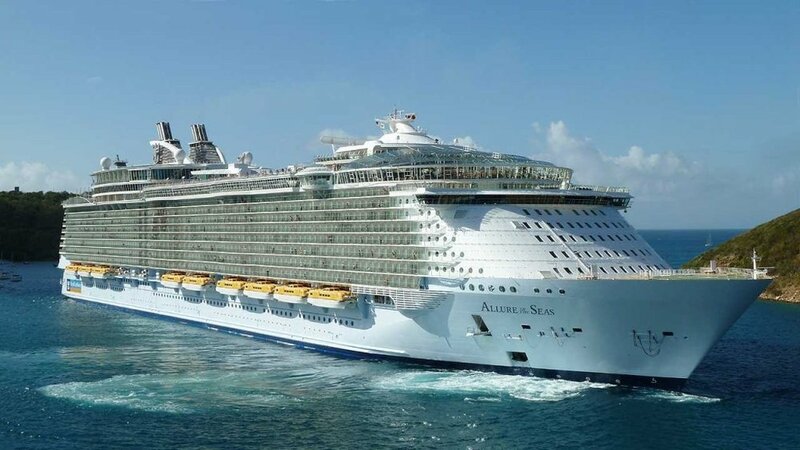 November 4, 2013, on several consecutive cruises, Oasis of the Seas was experiencing propulsion system problems, resulting in lower cruising speed. Due to these incidents, Royal Caribbean changed many itineraries by shortening port stays in Nassau (Bahamas, by 1 hour) and in St Thomas (USVI, by 3 hours). To fix the problems, the Oasis ship entered dry-dock in Nassau for repairs on February 24, 2014. December 9, 2013, the ship left a malfunctioned lifeboat in Nassau Bahamas. The boat (number 1) became in-operational after its lift cable snapped and needed repairs. September 4, 2015, after considering the numerous responses from RCI customers, the line decided to change the departure date and the itinerary of its specially themed “President’s Cruise 2016” on the Allure ship. The theme voyage (which features the Royal Caribbean International company’s CEO and President Michael Bayley) was rescheduled for September 18, instead of Sept 11. The round-trip Port Everglades (Fort Lauderdale) “President Cruise” itinerary was changed from 7-days Eastern Caribbean (ports of call: Nassau Bahamas, sea-day, Charlotte Amalie St Thomas, Philipsburg St Maarten, seaday) to 7-days Eastern Caribbean with ports of call Nassau, sea day, San Juan Puerto Rico (overnight port stay) and St Thomas. February 6, 2011, a 32-year-old female crew was found dead in Cozumel. The body was recovered from the ocean. Autopsy showed drowning as cause of death, but the woman also suffered blows to the head and other parts of the corpse. The victim (Polish in origin) worked as a musician on the ship. The investigation of a possible murder case resulted in the arrest and murder charge of a 24-year-old Mexican bartender in Cozumel. December 8, 2011, a male passenger died from cardiac arrest (death from natural causes). February 3, 2012, a 30-year-old male passenger jumped overboard and died. The body was found, and the suicide was confirmed by CCTV camera records. The dead passenger was British. The itinerary was a 7-day roundtrip Mexico cruise from Fort Lauderdale to Cozumel. The ship was chartered by Atlantis Events (gay cruise travel agency). February 14, 2012, a male passenger collapsed in his cabin and in front of his wife. She raised the alarm, and the med staff found him not breathing and without pulse. Their resuscitation efforts were unsuccessful, and he was pronounced dead (by natural causes, preexisting medical condition). September 16, 2012, a 21-year-old female passenger jumped overboard. While falling down, the body struck on the arm (but didn’t injured) a woman which was on her cabin’s balcony on deck 10. CCTV camera records confirmed a suicide, showing the young woman going over the rail of her cabin’s balcony on deck 12 and jumping into the water. The young woman was traveling together with her mother (50-year-old) both living in Bartlett Tennessee. At the time of the accident, the ship was en-route from Port Everglades (Fort Lauderdale) to Nassau Bahamas, and at ~50 ml (80 km) off of Ft Lauderdale. Due to this incident, the Nassau port call was canceled and the ship continued directly to St Martin. In 2013 were filed several crime reports on theft done on the ship by passengers (Aug 18 shoplifting, Jan 16 iPhone, Jan 20 cellphone, Feb 17 iPhone, Sept 1 jewelry, Sept 15 luggage, Sept 22 cellphone) and by crew (Aug 4 watch, Sept 22 jewelry, Sept 29 Amazon Kindle). February 11, 2011, a 51-year-old male passenger from West Hollywood, California, was arrested for selling drugs to other passengers. The arrest was done in St Thomas (USVI). During this incident, the ship was chartered for a Bahamas gay-themed cruise. Cabin search yielded over 140 pills of ecstasy, ~3 gr methamphetamine and in cash US$51,000. In November 2011, the man was sentenced to 21 months in jail for drug dealing on cruise ship. September 3, 2011, a male passenger was suffering from gastrointestinal bleeding. He was medevaced and transported first to to Key West then to Miami (Baptist Hospital). January 4, 2012, a teenage girl was raped by two other passengers – a 15-year-old boy and a 20-year old man. Both were arrested in Port Everglades. The girl was lured from the “Fuel” disco (teens-only lounge area) to their cabin. The victim and her family (from Iowa) were on a 10-day Christmas cruise vacation (roundtrip from Ft Lauderdale FL). October 16, 2012, when the ship was docked in Port Everglades (Fort Lauderdale FL), the police arrested 2 crew members (both 25-year-old) for cocaine smuggling. They were stopped during a routine inspection upon disembarkation. After scanning a backpack, a police dog was brought. The substance found inside tested positive for cocaine. During questioning, one of them said he knew about the drug, and told detectives they have received the backpack with the drugs from a man in Falmouth, Jamaica. Both were charged with drug trafficking of over 1 kilo of cocaine.